My sister was recently in Japan and took a picture of this advertisement. We very much enjoy[ed] relaxing in the serenity of mother nature. Watching a happy BUTA hobble along the beach. We immediately fell in love with the tropical island and the BUTA. It happened in January 1985. The BUTA is know[n] as a symbol of happiness. "BUTA", the logo on our clothes, represents the happiness we feel in our hearts. We hope to share this happiness with those who wear our clothes." 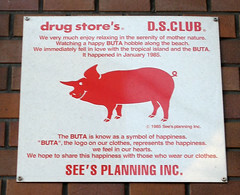 'Buta' is the Japanese word for pig.